A medium sized basalt stone with an incised canoe or vaka. 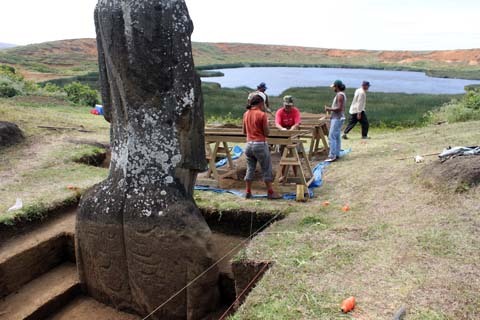 October- November 2010: EISP's excavation of a moai in Rano Raraku Quarry interior. We have just returned from a great adventure: our second season of excavation in Rano Raraku Quarry! Our team is the first to conduct authorized excavations in Rano Raraku since Thor Heyerdahl and his Norwegian Archaeological Expedition, 1954-55. Through the generous support of the Archaeological Institute of America (AIA; www.archaeological.org), we will collect surface and sub-surface stone condition data and monitor environmental conditions vital to statue conservation. In 1914-15 the Mana Expedition, co-led by Katherine Pease Routledge and her husband, William Scoresby Routledge, “dug” both of the statues we are now excavating. Unfortunately, they did not adequately document and publish their information. A Rapanui man named “Langitopa” worked with Katherine Routledge. Langitopa told Routledge that the shorter statue (RR-001-156) was named “Papa” and the other, taller statue (RR-001-157) was “Papa’s Wife.” These names, given in jest, reflect a wry opinion of the Routledges. Darío Icka, on our excavation team, is a direct descendant of Langitopa. Katherine Routledge’s field notes led us to believe that she had reached the base of Moai RR-001-157 and that it was 5.70 m tall. She was wrong. We discovered that the statue was over 8 m tall and erected upright on a stone pavement about 1 m below the bedrock (papa)! Our most important, poignant discovery, however, was under the statue: a basalt stone with a beautifully etched vaka on it! Did we discover, in fact, the “signature” of the proud master carver who created this magnificent moai? Or the identity of the group that commissioned it? Design similarity between the carved stone and the crescent-shaped petroglyphs on the statue’s back—both above and below ground—is provocative evidence of continuity in social identity over time. Read our preliminary report for a more complete picture and view the interesting objects encountered. Our excavation will continue in March, and you are invited to follow our progress on this web site. We need your help. Click on support and join us in this important work.